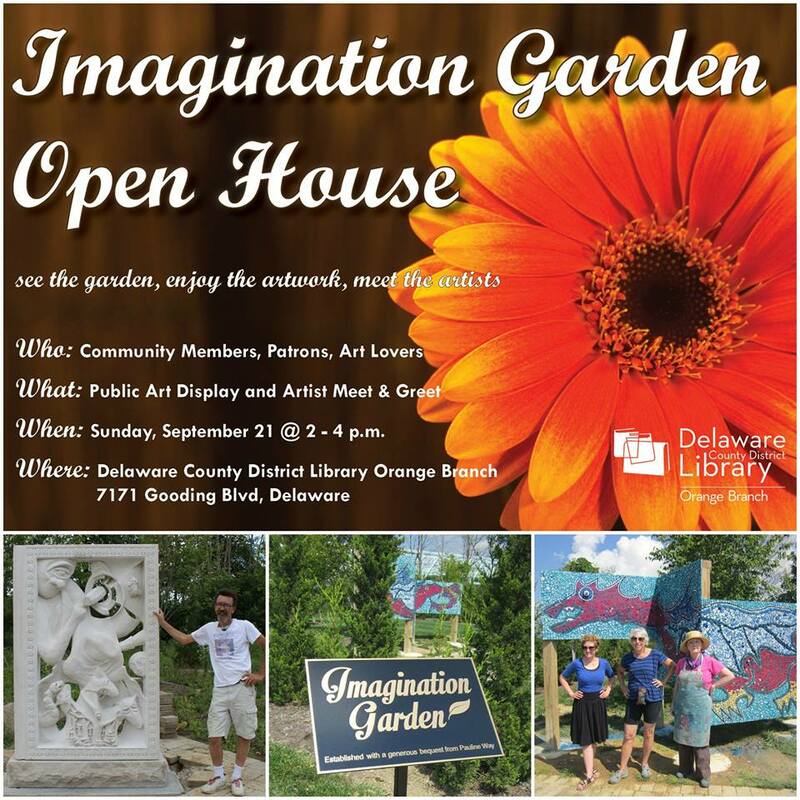 Community members are invited to explore a place where it’s not uncommon for a dragon and Dionysus to dwell in perfect harmony–the Imagination Garden at Delaware County District Library Orange Branch. An open house will take place on Sunday, September 21 from 2 – 4 p.m. in the garden, which is situated on the north side of the building. Two art pieces, a tiled dragon mosaic and a mythological sculpture, will be featured and the artists behind their creation will be present to display their works and answer questions. Attendees will also enjoy light refreshments, and a children’s craft. Dale Johnson’s sculpture, Mythology –or– On the Origin of Stories, was installed last summer. The piece mimics a classic book that has been taken over by mythological creatures such as the Cyclops, a sea monster, aliens, leprechauns and Dionysus. The piece started as a 4,830 lb piece of limestone and took seven months to carve. Artists Lynda Elias and Virginia Corwin added their touch to the garden this summer with the addition of a giant, tiled dragon. The colorful arrangement of mosaic tiles and mirrored pieces glued to several large zig-zagging panels help simulate the movement of a colossal, whimsical, winged creature flying through the garden. Earlier this spring five large, concrete panels were installed, and soon thereafter Elias was drawing the outlines for the dragon. The work of tiling all of the pieces and grouting took about one week to finish in early July with the help of more than four-dozen DCDL patrons and community members. The establishment of the Imagination Garden was made possible through a generous bequest by local community member Pauline Way. Bequests from Mary Reed and Barbara Murray also helped make the Imagination Garden possible. Their memory is honored on two of seven benches located within the garden. The remaining five benches and other markers are available for community members to recognize, honor, and memorialize their loved ones. Just a reminder that the Delaware County District Library and its branches will be OPEN on Jug Day, Thursday, September 18th. Hope to see you in the Library!